Thousands of people including workers, labor union leaders, youth volunteers, professionals, legislators, and common tao rallied behind the banners of designated labor groups yesterday to observe the 107th International Labor Day celebrations, which resulted in traffic flows being totally paralyzed in nearly four hours’ time. Close to twenty five (25) labor as well as people’s organizations participated in the event and walked the main thoroughfare of Quezon City that leads to the famous Mendiola. 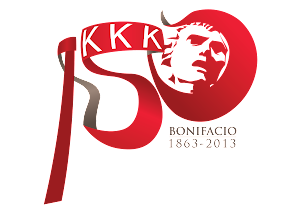 This is despite several steps taken by the Gloria Macapagal Arroyo administration to abate the force of the labor movement, which is always expected to gather its troops in Metro Manila and in other major cities in the Philippines to commemorate the true national holiday of workers. Aside from making May 3 as the official nonworking holiday instead of May 1, in accordance with the so-named “holiday economics”, the Malacañan Palace took other profane measures to degrade the essence of May 1 by arranging job fairs that promote further the OFW phenomenon – a clear manifestation of the government’s view of workers as merely “export commodities” which is quite demeaning on the part of true Filipino laborers. Under the theme “Labor Vote for Secure and Quality Jobs, Labor Justice, Labor Rights and Social Protection,” a short prelude to the Mendiola program was held at the Welcome Rotonda in Quezon City where Rep. Risa Hontiveros-Baraquel of the Akbayan Party-list addressed the crowd. Present also in the opening ceremonies were Akbayan Party-list nominees Prof. Walden Bello and Atty. Kaka Bag-ao. Other speakers included representatives from participating labor unions and alliances. Afterwards, the march to Mendiola, headed by the leaders of participating groups which count among their ranks APL and LEARN Chairperson Daniel L. Edralin and APL Secretary-General Josua Mata, began. The March was interrupted shortly in Morayta where the Bukluran ng Manggagawang Pilipino (BMP) met with the advancing troops. The interruption gave way to the speeches delivered by APL director Edwin Bustillos, Akbayan incumbent representative Bello and Atty. Bag-ao. Bustillos condemned “Villaroyo”, which is an alliance between GMA and presidential candidate Manny Villar, and dismissed it as pro-capitalist and elitist. Upon reaching Mendiola, labor union leaders called on their fellow workers that it is high time for the labor movement to institutionally put forward the longstanding issues that are worth yelling for. The labor movement strives hard for the advancement of full employment policies, increased social protection, effective labor justice and strengthened protection of labor rights. In line with this thrust is the labor movement’s expressed support for candidates and parties who are willing to espouse the labor agenda and continue to fight for the sake of workers. Many workers’ groups pin their hopes on Akbayan and Risa Hontiveros to do these tasks for them. One of the labor movement’s key principles, the labor agenda relies on the concept and practice of “labor vote”, which can be considered as a form of bloc voting. According to this concept, labor organizations will encourage their members to vote only for candidates and parties who are eager to take concrete steps towards achieving the goals of the labor agenda by actually signing a Memorandum of Agreement between them and these political actors. This is assumed to strengthen the workers’ bargaining power and political grip on politicians who aspire to be elected in the upcoming polls. Once these politicians commit mistakes and fail to execute key labor principles, they will run a great risk of being unseated through formal political processes such as recall elections and impeachment. 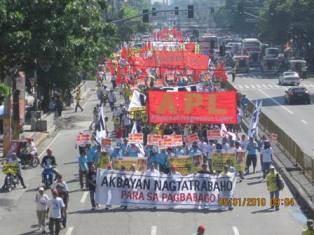 The groups who were banded together during the successful event were the Alliance of Coca-Cola Unions-Philippines (ACCUP), Alliance of Progressive Labor (APL), Akbayan Party-list, Automotive Industry Workers’ Alliance (AIWA), Confederation of Independent Unions in the Public Sector (CIU), Global Network (GN), Kapisanan ng mga Manggagawa sa Government Financial Institutions (KAMAGFI), Kapisanan ng Maralitang Obrero (KAMAO), Kongreso ng Pagkakaisa ng mga Manggagawa sa Pilipinas (KPMP). League of Independent Bank Organizations (LIBO), National Alliance of Broadcast Unions (NABU), National Confederation of Transportworkers’ Unions (NCTU), National Labor Union (NLU). National Union of Workers in Hotel, Restaurant and Allied Industries (NUWHRAIN), Philippine Metalworkers’ Alliance (PMA), Pinag-isang Tinig at Lakas ng Anakpawis (PIGLAS), Postal Employees Union of the Philippines (PEUP), and Workers’ Solidarity Network (WSN). Other groups who met with the marching party in Morayta include the Bukluran ng Manggagawang Pilipino (BMP), Makabayang Koalisyon ng Mamamayan (MAKABAYAN) and Partido ng Manggagawa (PM). This entry was posted in news on May 21, 2010 by mabini. This year’s National Congress was held at the Jade Valley Cantonese Restaurant in the corner of Sct. Torillo and Sct. Rallos, Quezon City. Some of the guest speakers were APL and LEARN Chairperson Daniel L. Edralin, APL Director Edwin Bustillos, SASK’s Asia Pacific Regional Coordinator Marlon Quesada, SSS Commissioner Vic Balais, Atty. Tanya Karina A. lat of the Initiatives for Dialogue and Empowerment through Alternative Legal Services (IDEALS) and Akbayan Representative Walden Bello. This entry was posted in statement on May 2, 2010 by mabini.